It's that time of year again! Join us as we celebrate four years of Trivia Club in Toronto with another edition of the Grand Championship Grand Prix! Teams top TWO scores at Cardinal Rule, their top score at Lou Dawg's Southern BBQ, and their top score at HitchLimited in the month of April, will be accumulated with the Grand Champion taking home the double-decker GOLDEN VCR! Listed teams have either scored more then 50 points, won a VHS, or made an appearance at two different locations during the Grand Prix. 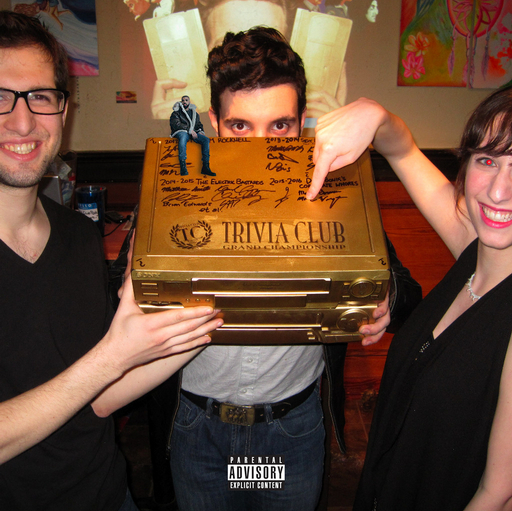 Thank you for joining us as we celebrated four years of Trivia Club in Toronto with another edition of the Grand Championship Grand Prix! Teams top TWO scores at Cardinal Rule, their top score at Lou Dawg's Southern BBQ, and their top score at HitchLimited in the month of April, were accumulated with the Grand Champion taking home the double-decker GOLDEN VCR! As every year that we've celebrated our anniversary at Cardinal Rule, their was an added wrinkle! For the fourth anniversary, teams were able to #chooseyourownadventure on the Road to the Golden VCR and what an adventure it was! In WEEK ONE, teams competed at either Lou Dawg's on the 5th of April or Cardinal Rule on the 6th of April. In WEEK TWO, teams competed at either Hitch on the 11th or Lou Dawg's on the 12th, with EVERYONE being invited to JOIN US on the actual night of Trivia Club's ANNIVERSARY, April 13th at Cardinal Rule! In WEEK THREE, teams competed at either Lou Dawgs on the 19th or Cardinal Rule on the 20th. In WEEK FOUR, teams finally got the choice of either Hitch on the 25th or Lou Dawg's on the 26th, and once again we invited ALL THE TEAMS competing in the Grand Championship Grand Prix to come out to the GRAND PRIX FINALE at Cardinal Rule on April 27th as we awarded not just a Golden VHS on the night but the Golden VCR to the winner Trivia Club's fourth Grand Champion! To begin the month of April, the Cunning Stunts won at Lou Dawg's BBQ to wrack up the first Golden VHS of April and 110 points along with it! David Bowie's Corporate Whores followed that up with 164 points the very next day! This would be followed with an impressive one-two punch in week two of the Grand Championship Grand Prix that saw David Bowie's Corporate Whores not only match the All-Time High Score at Hitch with 170 points but also grab an additional 196 points at Cardinal Rule for our Fourth Anniversary Spectacular, giving them the fifth highest score in the history of Cardinal Rule! It was truly an impressive run, which then ground to a halt in the preceeding weeks as outside plans warranted David Bowie's Corprate Whores to step back, and allowed the Cunning Stunts to push forward in an attempt to match a three-part score that even out-reached the Electric Bastards four-part score from the year before! As PETE! built towards a potential threepeat at Lou Dawg's, the Cunning Stunts once again came out to their own original home at Cardinal Rule, and won their 40th Golden VHS, while adding 136 points to their total! They then went on to Hitch, and as David Bowie's Corporate Whores did two weeks before, added the neccesary points in week four, 155 points in fact! This led us to a truly unpreditable situation, even though David Bowie's Corporate Whores had racked up 530 points in their first three potential nights fo the Grand Championship Grand Prix, the Cunning Stunts were within 129 points on the Finale night! And to push that number any higher, David Bowie had to score higher then 164 points! Their early success had taken the outcome out of their hands, and yet that early success had made the winningest team in the history of Trivia Club into the most unlikely of underdog stories! This, however, wouldn't be the story of the Cunning Stunts winning the Golden VHS. No, the only team to compete in all four years for the Golden VCR and nearly winning in each of the four years, would have to wait still. This is the story of David Bowie's Corporate Whores and their Grand Championship Grand Prix victory! Having first started participating in August of 2015, they hadn't dove into the waters of Lake Minnetonka until late November! And since then, they've become a team not to be underrated! This April, their 530 points in the Grand Championship Grand Prix top the Electric Bastards initial record of 516.5 points, and they did so with one less event. Their FOUR Golden VHS victories in a month nearly match the five Golden VHSes won by the Electric Bastards last year. David Bowie's Corporate Whores surprised an established group of teams within Trivia Club, and we look forward to the future of the game while continuing to celebrate our past on triviaclub.ca, and reveling in the present at every edition of Trivia Club! Russel Harder hosts Trivia Club at Cardinal Rule (5 Roncesvalles Ave) every WEDNESDAY, at Hitch (1216 Queen St East) every other MONDAY, and Lou Dawg's Ryerson (76 Gerrard St E) every TUESDAY!